I don’t get this excited very often about a beverage, and I certainly am not accustomed to getting all worked up over anything that adulterates the purity of my favorite beverage, black coffee. But the super fancy coffee-shop mini-chain La Columbe is always something special. And their Draft Lattes are something to write home about, or, rather, to blog the heck out of. I first became aware of La Colombe when I stumbled into their West Loop location in Chicago during the steamy Midwestern summer a few years back. They had an old Coke machine tricked out to dispense ice cold bottles of their absolutely amazing bottled cold black coffee. I was in love at first sip, to the point where I kept that first bottle of La Colombe on display on my bookshelf for literally three years, just to remind myself that no matter what, there is always SOME little pleasure to enjoy in life. This morning, I was stopping by their Andersonville location to pick up a bottle when I realized I wouldn’t have access to a bottle opener for the rest of the day. I pondered the cost-benefit ratio of buying one at the Walgreens for a bit, but I already have about five of the damn things, and anyway, as much as I love that cold, refreshing bottled coffee, I am too much a creature of habit. And these housemade canned lattes were only three bucks a pop. Give it a try, Katie, I thought. Live a little. How bad can it be? Now I wish I had waited till I was sitting down and comfy to open the can and enjoy. This is different from any other canned or bottled coffee drink. I will NEVER drink a Starbucks bottled beverage again. Holy crap. I am struggling to figure out how to convey just how good this is… they somehow canned foamed milk, with all the texture that entails, and juuuust enough sweetness to be refreshing but nowhere near cloying, combined with just enough rich, bitter espresso taste to let your brain know the caffeine is coming. You can buy sweetened/flavored versions, I think I saw vanilla and mocha, but you don’t need it. The pure flavor of the espresso dances with the milk in a way I could go on enjoying all day, except I would die of a heart attack. Remember, I’m a black coffee girl, and I’m having a tastegasm over this. 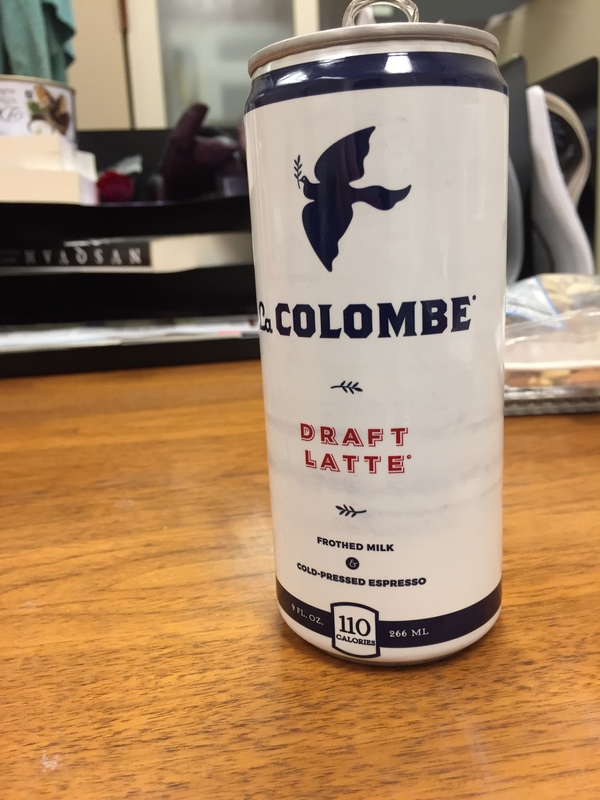 Consider yourself recommended, la Colombe Draft Latte!